The Red Bull-branded factory KTM MotoGP machines, new satellite Tech3 bikes plus Moto2 and Moto3 entries unveiled in Austria. 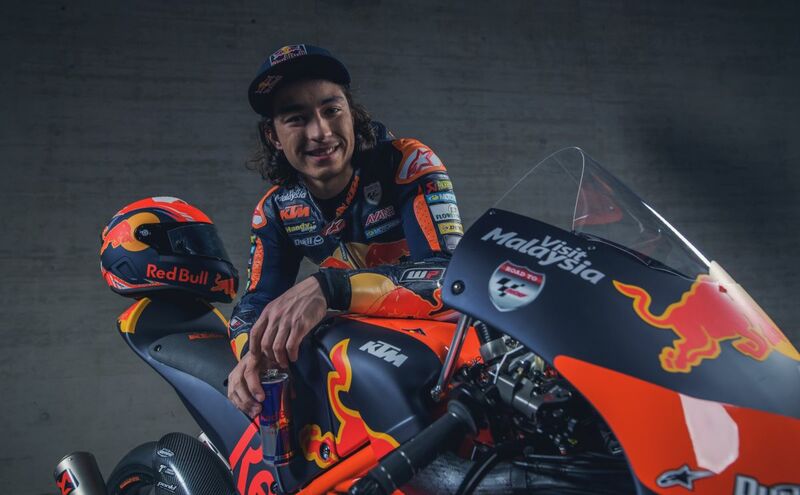 Red Bull and KTM have presented the 2019 colours for the factory MotoGP team and new satellite Tech3 machines, during a ceremony in Mattighofen, Austria. In total, five different projects were in attendance, with Tech3 also switching its Moto2 team to the KTM chassis, while Ajo continues to run the Red Bull KTM Moto2 and Moto3 entries. KTM, which claimed its first MotoGP podium courtesy of Pol Espargaro at November's wet Valencia season finale, has taken a best dry race result of ninth since joining the premier-class with the RC16 at the end of 2017. “Racing is the core content of our DNA. That means forced innovation every week or every two weeks," said KTM CEO Stefan Pierer. "We see on the TV or the internet how many tenths of a second are missing and that really drives us to do everything what we can in the end to touch the top of the podium. "That's our philosophy and that has driven us to success over the last thirty years but in this racing world we are still beginners: this is our third year. The Austrian manufacturer ran Bradley Smith alongside Espargaro for the past two seasons, but has signed six-time MotoGP podium finisher Johann Zarco in place of the Englishman for 2019 and 2020. Zarco, rookie of the year in 2017 and top satellite rider in both 2017 and 2018, moves from Tech3 to KTM at the same time as his former team. “I’m happy to be here, and this is my first factory team presentation!" Zarco said. "I discovered Mattighofen and the KTM factory for the first time in January and I was very impressed. "After a few tests now I am very happy: I feel that the people in the team trust me and it’s nice to feel that confidence. We’ve done some good work so the motivation is high. The Frenchman (17th, +1.4s) edged out Pol Espargaro to be top KTM for the first time at the recent Sepang test, when Oliveira (19th) likewise turned the tables on Syahrin (23rd). The final MotoGP pre-season test will be held in Qatar from February 23-25. Commenting on the expanded KTM line-up, Espargaro said: "Johann has integrated into the team well and already looks fast. It means that we are set for the season. I thought Miguel was very fast at the test and that was surprising for a rookie and I know Hafizh is working really hard. All the info the Tech3 guys can bring will be helpful for me, the team and all the engineers. KTM and Aprilia are the only manufacturers with technical concessions, including extra engine changes, no engine design freeze and extra private testing. Espargaro's Valencia podium gave KTM the upper hand over Aprilia at the tail-end of the six-strong constructors' championship. The newly-retired Dani Pedrosa has signed to join Mika Kallio in KTM test riding duties but is currently sidelined by a collarbone injury. In the Moto2 class, reigning Moto3 champion Jorge Martin replaces Oliveira in the official Ajo team, alongside triple 2018 race winner Brad Binder. Martin, who was injured in testing at the end of last year, said: "Being part of this team is incredible. I am very proud to be part of this big family and I hope we can achieve great things together. It's my first season in Moto2, so my main goal this year is to learn as much as I can. I will work hard and do my best; so we'll go for it. Even though my first experience with the bike was short, the feeling was really good. I trained hard this winter and I can't wait to get started." Fellow rookies Philipp Oettl and Marco Bezzecchi will race the new Tech3 Moto2 bikes. The sole Red Bull Ajo Moto3 machine will be for Can Oncu, who took a stunning victory on his grand prix debut as a wild-card at Valencia. “It's a dream come true to be here today. I have always dreamt of being a world championship rider, so I'm very happy to have achieved it," Oncu said. "My aim for this season is to learn as much as possible. New circuits will be coming up for me where we will have to work hard to learn and adapt to them. Nevertheless, I am going to give my all to try to achieve good results. I want to make the most of this great opportunity." Casting his eye over the Red Bull-backed Moto2 and Moto3 projects, KTM Motorsport Director Pit Beirer said: “In Moto2 and Moto3 there are tight rules so you cannot go crazy on individual bike development. It makes the classes very attractive and with really close racing. There is definitely a strong battle to be on a top level in Moto3 but it is also a competition to progress young riders and we really like this class because it was our first base into road racing. "Without a Moto3 project we would not have a MotoGP bike today and you have to work so closely and carefully to make gains there. It is our base, and it leads us directly onto why we are in Moto2 because it is the next step. The rules are completely different with the single engine supplier but it still makes a lot of sense for us to learn about the bigger bike and where the rider also learns. Pierer added: "Today we are not looking just at the top end of MotoGP but also at the beginners and those who come from the Rookies Cup and with the help of our long-term partners Red Bull. It is a comprehensive programme and it is delivering.